File photo. The man was a call operator in the fire service. 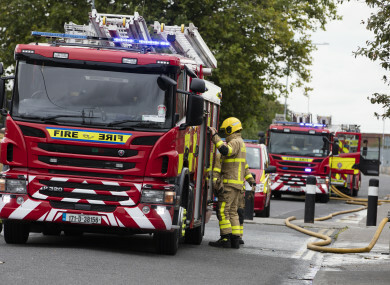 A FORMER EMERGENCY service controller has won an unfair dismissal case against Dublin City Council and been awarded €5,000, after the Workplace Relations Commission (WRC) found “procedural flaws” in how the man was sacked. The worker was dismissed over his conduct in three incidents, including a claim that he had improperly accessed a live recording of an emergency call. The man claimed in his case he was dismissed under a code that did not permit dismissals to be made, had not been given any advance warning that he was at risk of dismissal, and was not afforded the right to appeal the decision to fire him. The WRC noted that the man’s own conduct contributed to his dismissal by 50%, but still found his complaint “well founded”. His wish to be reinstated to his position however, was considered inappropriate “given the breakdown of trust between the parties”. He said that, during the investigations into the three incidents, his employers did not approach them with an open mind because “they just wanted [him] out”. He started work in October 2015, and his probationary period was due to expire the following year. The first incident, in August 2016, involved a call being made to the emergency centre when the man was on duty. He took the call, but didn’t process it correctly and afterwards closed the case, according to his employers. “This meant that not only was the emergency call not responded to, but the record of the call was deleted by him,” they said. The man said that he accepted fault for this matter but that a decision to extend his probationary period was evidence that his employers were “trying to set up an easy route for them to get me out of the [fire] service”. The second incident – which took place the same month he started the job – came to light some time later. Dublin City Council’s representative said that the worker had sent a false PHECC identification, which identifies someone as a trained and qualified paramedic, to a friend of his who worked for the Ambulance Service and was looking for someone to assist with St John’s Ambulance cover at an outdoor event. The man accepted he sent it but immediately told his friend not to use it. Gardaí decided not to mount criminal charges over the incident. The worker said that he believed this incident was “reactivated” 16 months after it happened so that it could be “rolled into the other complaints in order to add evidence to a case to dismiss [him]“. The third incident related to an emergency phone call that was made on the day that the a relative of the man died. A member of the public – who was in the house on the day his family member died - made a complaint about the worker, claiming she received a private message from him where he alleged that he had inappropriately accessed the live recording of the 999 call. The worker denied he had accessed the call, but had been told by a third party that no CPR had been attempted on his family member that day. He said he had sent a private message to this woman because she had been saying things online about the family member’s death that had caused hurt to his family. I was entitled to tell the person to stop aggravating my family by her online behaviour and I did so. This person was present when my [family member] used illegal drugs and died from an overdose and yet this person took no action to prevent it nor took any action to ameliorate the situation, by giving CPR when she knew that [the member of my family] was in a critical condition. The worker added that it was a private matter and should not have been a basis for firing him. His employers, meanwhile, said that even if it was the case that he hadn’t accessed the recording, his private message to the woman gave the impression he had, which is prohibited and brought the fire service into disrepute. It was acknowledged, however, that the code of conduct the employee was told he was being investigated under had no sanction within it to dismiss someone. Ruling in the man’s favour, the WRC adjudicator found that “procedural flaws” in the investigation of the three incidents were “so flagrant that they rendered the decision to be flawed”. However, given the worker’s conduct, the adjudication officer also found that he contributed to his own dismissal. She said: “I also find that the Complainant gave the impression that he had improperly accessed a live recording of an emergency call. I do not find that the Complainant did access this call, nor do I find that the Complainant should have been prevented from responding to on-line provocations that affected his family at a time of great distress. It is his right as a private person to so respond. However, his words, whilst unintentional, gave the impression that he had listened to the live emergency call recording, and giving that impression undermined the reputation of the Respondent, who give the public assurances that such calls are only accessible by gardaí investigating an offence or by the call handler who receives the call at first hand. She said that the man’s request for reinstatement was not appropriate given the breakdown in trust, and his own contribution to his dismissal. “Allowing for a discount for contributory conduct, I award the complainant €5,000 in respect of his unfair dismissal,” the adjudicator concluded. Email “'They wanted me out': Former emergency service controller awarded €5k over 'flawed' disciplinary probe”. Feedback on “'They wanted me out': Former emergency service controller awarded €5k over 'flawed' disciplinary probe”.